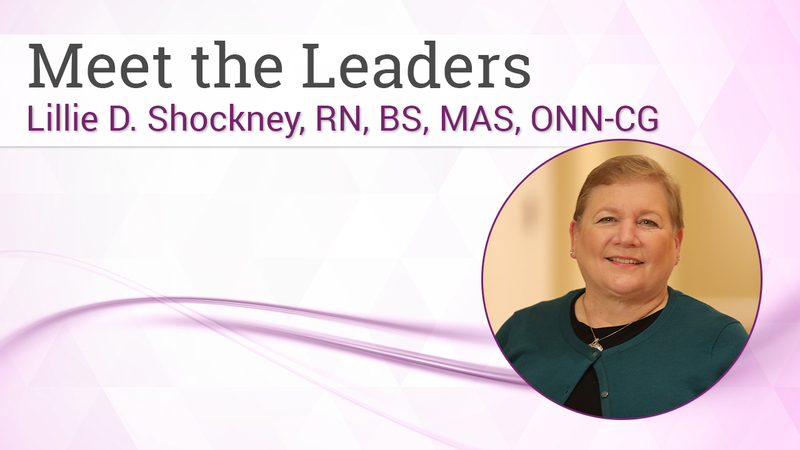 Lillie D. Shockney has been the Administrative Director of the Johns Hopkins Breast Center, Baltimore, Maryland, since 1997. A 2-time breast cancer survivor, Lillie has worked tirelessly to improve the care of patients with breast cancer around the world. She is a registered nurse with a bachelor of science in health administration from Saint Joseph’s College, New York, and a master of administrative science from Johns Hopkins University, Baltimore. She has worked at Johns Hopkins since 1983 and has been Director of the Breast Center since 1997. Lillie is a published author and nationally recognized speaker on breast cancer, having written 15 books and more than 300 articles on the subject. She serves on the medical advisory board of 34 national breast cancer organizations, and is the co-founder and vice president of national nonprofit organization called Mothers Supporting Daughters with Breast Cancer. Lillie serves as “Ask an Expert” for the Johns Hopkins Breast Center. She also is an active clinical researcher, with a focus on quality-of-life issues for survivors, as well as a strong advocate for patients with stage IV breast cancer. In 2008, the Johns Hopkins Board of Trustees appointed Lillie to a physician chair as a University Distinguished Service Assistant Professor of Breast Cancer. It was the first time in the history of the institution that a hospital nurse has been appointed to a distinguished service designation. Since then she has climbed the physician academic ladder to the top and became a full professor of surgery and oncology in the Johns Hopkins University School of Medicine in 2016. She has received 46 national and 6 state awards, including being chosen by Johnson & Johnson as the Most Amazing Nurse in America. In this edition of What Would Lillie Do? – WWLD, Lillie discusses how to screen patients with cancer for clinical trials and more. Sow a Seed for Your Professional Growth: Join Us at the AONN+ Midyear Conference! Palliative care has a serious identity problem. Seventy percent of Americans describe themselves as “not at all knowledgeable” about palliative care, and most healthcare professionals believe it is synonymous with end-of-life care.1 This perception is not far from current medical practice, because specialty palliative care—administered by clinicians with expertise in palliative medicine—is predominantly offered through hospice care or inpatient consultation only after life-prolonging treatment has failed. This means that the majority of patients who could benefit from palliative care are not receiving it until they are very close to death. To ensure that patients with metastatic breast cancer receive the best cancer care throughout their disease trajectory, palliative care should be initiated alongside standard oncology care, and it should be implemented early. In addition to the obligatory orange and black decorations of October, it’s also the time of year to don your pink in honor of Breast Cancer Awareness Month! The progress we have made as a nation in elevating the importance of regular breast cancer screenings, funding research, and supporting breast cancer survivors has had a direct impact on our ability to increase and improve survivorship. How do you establish a successful navigation program? The answers are right here in this issue! Some days it's hard to laugh and easy to cry, especially when confronted with the harsh reality of cancer. But according to Lillie D. Shockney, RN, BS, MAS, ONN-CG, Director of Cancer Survivorship Programs at Johns Hopkins, finding humor in the day-to-day can actually boost the immune system and improve the overall health of patients with cancer. The Academy of Oncology Nurse & Patient Navigators (AONN+) is hosting its Annual Conference in Dallas, TX, November 15-18 at the Hilton Anatole. In keeping with the popular slogan—Everything's Bigger in Texas—the Ninth Annual Navigation & Survivorship Conference is going to be huge! More than 1000 nurse and patient navigators are anticipated to come to Dallas and discuss their role in the perpetually evolving oncology care landscape. Having a universal tool to measure patient experience, clinical outcome, and return on investment is critical to ensuring the success not only of navigation programs but oncology programs at large. Genetic Testing Being Mainstreamed to Consumers—Good or Bad Idea? JONS Editor in Chief, Lillie Shockney, RN, BS, MAS, ONN-CG, offers her insights on the timely topic of commercially available genetic testing. The Biden Cancer Initiative builds on former Vice President Joe Biden’s work on the National Cancer Moonshot Initiative by developing and driving implementation of solutions to accelerate progress in cancer prevention, detection, diagnosis, research, and care, and to reduce disparities in cancer outcomes. This is your year to conduct research and share your findings. AONN+ and the AQUIRE committee can help you to reach this goal. Oncology navigation has made great strides in improving cancer care, including access to quality care, for nearly 3 decades. Navigation programs are well established for most patient populations with solid organ tumors, but less so within the patient populations with liquid cancers. I am pleased to report that this is changing, and it is wonderful to see. In this Special Edition, we direct our attention to lung cancer and the positive impact navigators have had in this disease state. In this issue, we present original research as well as coverage from recent oncology meetings. On the navigation front, we feature articles from our own Academy of Oncology Nurse & Patient Navigators (AONN+) West Coast Regional Meeting. One of the many responsibilities of a navigator is to facilitate patient education—it is therefore imperative that we educate ourselves on new treatments, distill the information into lay terms, and use that information to effectively educate our patients. Our current treatment strategy for patients with DCIS has recently come under scrutiny _ Ms. Shockney discusses the reassessment of appropriate management of patients with stage 0 cancer. The navigation successes we report in these pages have positively affected the culture of nursing at every phase of care from prevention through survivorship. Calling All Navigators: Join AONN+ and Further Our Progress in Overcoming Barriers to Care! With this issue of JONS, we pay tribute to our beginnings as navigators in breast cancer management by recognizing our national breast cancer awareness month and focusing on best practices in breast cancer. This issue of JONS also comprises a wealth of learning guides dedicated to providing patient navigators with information about the core competencies of navigation. Lillie praises the Journal of Oncology Navigation & Survivorship (JONS) for its wealth of information from a variety of experts in the field. The publication provides all-encompassing information for navigators and is one of the only publications that talks about survivorship. Beginning a navigation program can be intimidating and there is not one program that fits every institution. Lillie recommends visiting other institutions that have established programs as a starting point. We have been hearing about the Affordable Care Act (ACA) for quite a while. However, many are still confused as to what this law is trying to accomplish and how it will benefit various populations of patients across the United States. This fourth issue of Conquering the Cancer Care Continuum™ provides readers with a comprehensive overview of the ACA as seen from the eyes of an oncology nurse, an insurance payer, and a pharmacist. There is nothing that pulls at my heart strings more than the sight of a young child dealing with a diagnosis of cancer. This issue of Conquering the Cancer Care Continuum™ focuses on pediatric cancer care, a challenging area of oncology management, but one in which amazing progress is being made. This issue focuses on current good manufacturing practice (cGMP) and includes articles written by a clinical oncology pharmacist, an oncology nurse practitioner, and a regulatory lawyer. Among the various types of treatment that a patient with cancer may undergo, chemotherapy is associated with the greatest concerns with respect to side effects. This issue of the Journal of Oncology Navigation &amp; Survivorship (JONS) provides new insights into several important and key issues that many of you and your managers have brought up: the infamous goal of how you can demonstrate through evidence-based research that navigation has a positive impact on cancer care. In this issue of the Journal of Oncology Navigation & Survivorship (JONS), we are proud to present the evidence-based research abstracts that have been accepted to the Eighth Annual Navigation & Survivorship Conference of the Academy of Oncology Nurse & Patient Navigators (AONN+).